"This read-along of Ken Mochizuki's Passage to Freedom centers on Japanese diplomat Chiune Sugihara, who faces a difficult decision in 1940; should he follow a Japanese government mandate and refuse visas to Jewish refugees in Lithuania or follow his conscience and try to save lives? Events unfold through the eyes of Sugihara's young son, who does not fully understand the importance and danger of his father's heroics. 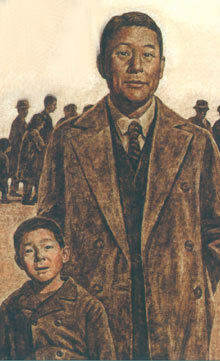 The powerful and moving narrative is further enhanced by the book's brown-hued illustrations. Occasionally, the author's narration lacks timing, and younger listeners may have trouble with the diction, yet Mochizuki's precise pronunciation of Japanese names and places adds to the authenticity. Sound effects highlight the dramatic and solemn mood. An excellent portrait of a brave and heroic individual who taught his family important values." "Books, particularly children's books, often transport readers to lands unknown or not yet explored. Books can be Aladdin's magic carpet or Emily Dickinson's frigate that takes us lands away. Picture books, with their evocative illustrations, amplify the adventures; better still, the picture book experience enhanced by audio interpretation. With PASSAGE TO FREEDOM, listeners will journey to Lithuania in 1940, where 5-year-old Hiroki Sugihara is witness to the decision of his father, the Japanese consul, to free desperate Polish Jewish refugees by writing them visas, despite his government's refusal. Children will respond to the judicious use of evocative music to punctuate a forthright narrative and will appreciate the extraordinary measure of heroism in the father and the generous spirit of his son." "'If you save the life of one person, it is as if you saved the world entire.' This was the exact sentiment of the Japanese diplomat, Sugihara, and his family in Lithuania in 1941. Contrary to government orders, he issued thousands of visas to Polish Jews who became Sugihara survivors and kept their worn pieces of freedom papers as family treasures. For his selfless acts of kindness, Sugihara received the "Righteous Among Nations" Award and in Yaotsu, Japan, the Hill of Humanity is named in his honor. The Sugihara story is brief and concise, but strong and emotional. It is a story of strong belief in doing what is compassionate and right regardless of the consequences. The strong emotions emerge from the dramatic reading and interpretation by Ken Mochizuki. Children will relate to the feelings of Hiroki, the eldest son, from whose eyes the story is narrated. Respect from family, sensitivity of others, and honor toward parents emanate from the narration. Language differences when the Polish children arrive never make a barrier in play or in empathy. Listening to the story is even more dramatic than reading it. The "Afterword" adds authenticity to the tory and brings the entire episode to closure. After listening, teachers can lead discussions about World War II, life-altering decisions, selflessness, compassion, and racial prejudice. This story of honor, love, and compassion presents a view of history that is seldom found in history book. It should be purchased by every public and school library."